Specially made for Vire motors only. Vire 7 requires two larger and one smaller core plugs fitted to the cylinder casting. The core plugs have a tendency to corrode and leak after many salty years or if left dried out with air behind. a leaking core plug, particularly if you have left on the seacock, could sink your boat! best to change them if you are in doubt about their integrity or at least every few years. if you have just bought the boat or overhauling the engine, then you should always replace these. 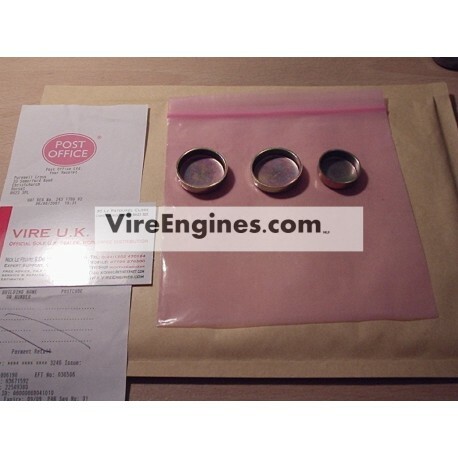 the vire series in particular is subject to saltwater staying in the cylinder mixed with air corroding these faster than a normal seawater cooled engine that has its cylinders below the waterline. The smaller boat's (having a Vire) waterline usually being about the height of the plugs. check to see if your vire has knackered plugs: tap a screwdriver blade into the centre of the plug quite hard. If it dents or is rusty at all replace. it's easy: first remove old plugs by driving a large flat blade screwdriver into the centre and levering out. Then hook out all the muck behind (grit from the seawater intake) to improve your cooling 'while you are at it' into a rag/bilges. Then clean up the hole with a scraper and sandpaper, so the new plug will have a smooth lipped hole to go into, then prime your new plug with a smear of gasket sealant round the edges. Find a socket or drift that is a bit smaller than the inside of the plug, and using a hammer drift it into the engine evenly till the lips are flush. Test run for leaks. Job done! (about 15 minutes) and you shouldnt need to remove anything from the engine during the process either!